4 Day 4WD hire + return barge/ferry and 3 nights motel style accommodation at Eurong Beach Resort for up to 3 people. 4 Day 4WD hire + return barge/ferry and 3 nights in a 2 bedroom self contained apartment at Eurong Beach Resort for up to 4 people. 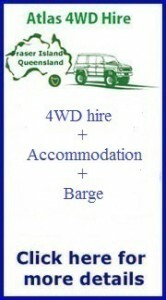 3 Day 4WD hire + return barge/ferry + camping equipment and all permits for 4 people. * To avoid disappointment we advise on booking early as the barge and accommodation fill up quickly around these times. * If you have a different amount of passengers or you would like more/less days, please contact us for the special price. *Rooms can be upgraded to superior air conditioned rooms. Please contact us for a price.